Sartorius presents the Arium® mini, and Arium® mini PLUS. 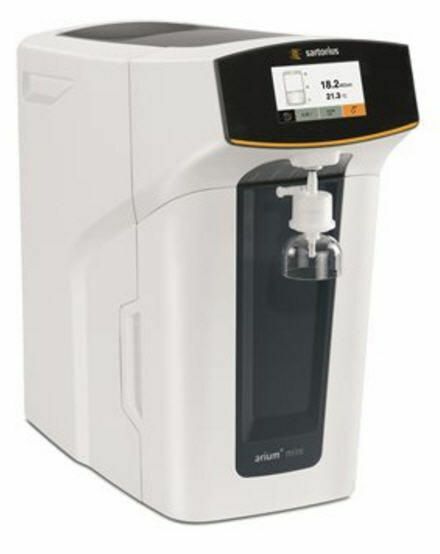 These compact ultrapure water systems are specially designed for ultrapure water requirements of less than 10 liters per day. 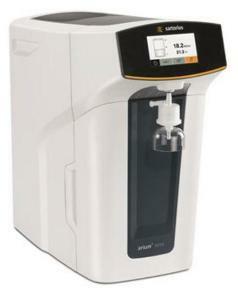 With the capacity to deliver ultrapure water at a rate of 1 L/min. and a width of only 28 cm (11"), these space-saving units easily integrate into nearly any lab environment. The Arium® mini PLUS connects directly to a feed water tap. The feed water is treated by a special designed pre-treatment cartridge, which consists of a combination of activated carbon and a reverse osmosis module. Available with or without a UV lamp. The Arium® mini does not have a direct water connection. The device is fed via the integrated bag, which is filled by means of a built-in pump. 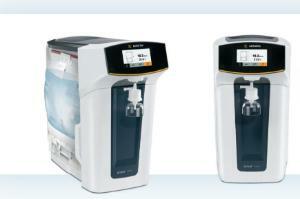 Pre-treated water (such as DI water or spring water) is transferred from a vessel into the bag and thus serves as feed water for the production of Type 1 ultrapure water. Available with or without a UV lamp. Ordering information: Available to US customers only. These systems includes a two-year manufacturer's warranty. Packaging: Mini PLUS Starter Sets include: Arium® mini PLUS, pre-treatment cartridge, Scientific Pack Deionization Kit, 5 L bag, and sterile final filter. Available with our without UV Lamp. Mini Starter Sets include: Arium® mini, Scientific Pack Deionization Kit, 5 L bag, and sterile final filter. Available with our without UV Lamp.